This space was originally conceived as a meeting place for the parish, receiving the name of Chapter’s chapel. The construction was ordered to Bartomeu Mas, the general contractor of the church, who built it between 1468 and 1486, including also the rectory’s remodelling and the emptying of the Saint Raphael and Saint Martin’s chapel for set up the access. The Chapter is conceived as a little church annexed to the southern side of the temple. It’s a single nave with polygonal apse and covered with two sections of rib vault. Its size is 17,45 meters length, 8,50 meters tight and 10,92 meters high. Its appearance is stark but elegant. Formerly the space was illuminated by three large windows, located in the southern and western walls. One of them stays bricked up as a consequence of the rectory’s extension works in the 18th century. In the 19th century two little windows were opened under the rood screen, located at the chapel’s bottom. A little bricked up door dated from the 15th century can be seen in the right wall. It was used in the past for the communication between the rectory and the church. Outwardly the only visible decoration is the large window’s canopy, in the western façade. It’s made in Flamboyant style and it has depicted angels holding phylacteries and one in the middle holding the Pi’s emblem. In addition are specially notorious the four capitals of the access door, decorated with a very-well chiselled fantastic animals. One of the capitals was lost, but in the other three can be seen monkeys and eagles at the left and two gryphons in the conserved capital, at the right. Also in the lower part of the left side there’s a toad. 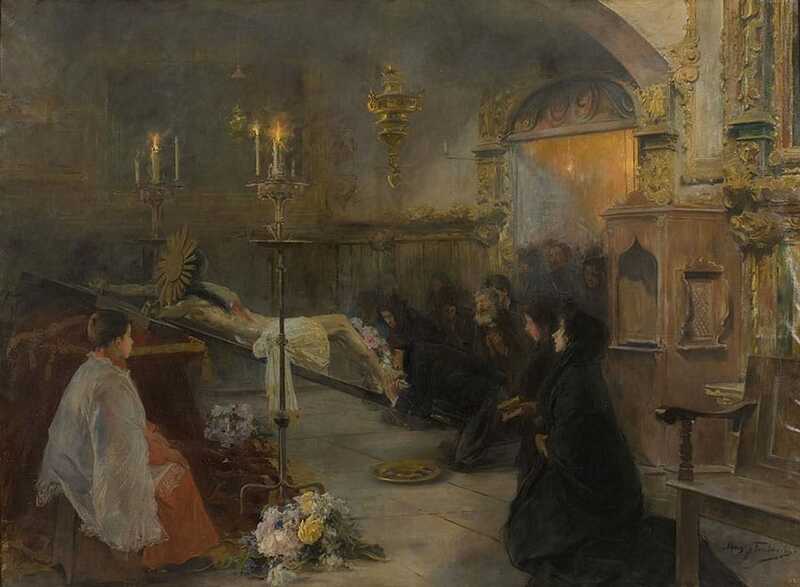 The Chapter was first dominated by an altarpiece devoted to Saint Eulalia and Saint Severus, and a crucifix donated by the Infante Henry of Aragon. In 1508 was moved the old altarpiece of the High Altar, dismantled during the construction of the new one. Months before the sacristan of Santa Maria del Pi, Pere Joan Matoses, bequeathed his large library to the church, with the condition of place it in the Chapter for the service of everyone, becoming the second public library in Barcelona. In 1547 the Barcelona’s Archconfraternity of the Purest Blood of Our Lord Jesus Christ was established in the Chapter and since then it was also known as “Blood’s chapel”. In 1616 the chapel was set up as reserve of the Blessed Sacrament and the Eucharistic administration. Some years later it was ordered a new decoration for the chapel to the sculptor Joan Gra, who finish the works in 1670. The decoration consisted in a great and sumptuous altarpiece in Baroque style, placed in the head of the chapel, with a camarin where the Holy Christ of the Blood or “Sant Cristo Gros” was worshiped. Beneath the Holy Christ there was the statue of Our Lady of Sorrows. In the sides of the altarpiece, covering the walls of the chapel, there were eleven large paintings with stages of the Passion framed in a fine wood-carved decoration. On the bottom were placed the confessionals. The Blood’s chapel was the favourite place of Saint Josep Oriol for hear in confession and receive the sick persons who came for being healed. Between this walls he realized many of his recoveries and miracles during his life. In 1764 the Archive was built on the roof’s chapel. 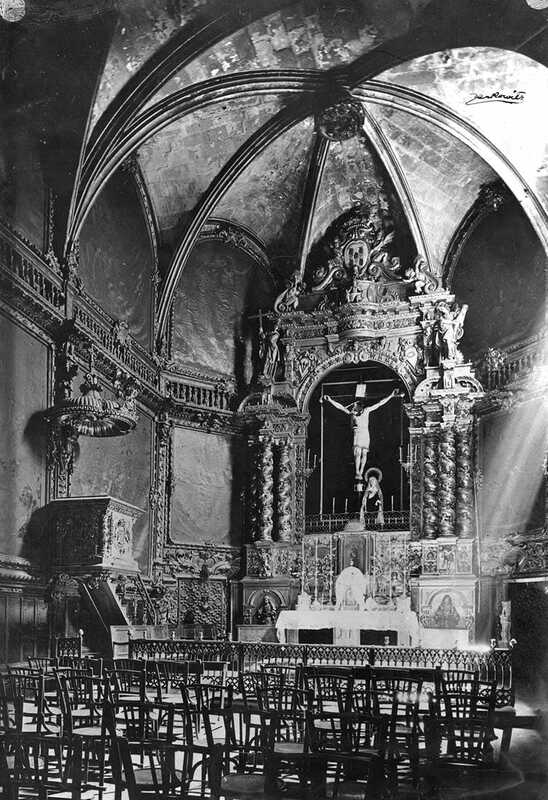 This was the last great modification before the fire of the Spanish Civil War (1936-1939), which completely destroyed the “Sant Cristo Gros”, the altarpiece and the interior decoration. The fire’s voracity even burst the vaults. After the war the Blood’s chapel was restored, a new statue of the Holy Christ was blessed and a new altarpiece was made in 1952 imitating the previous work of 1670. The Archconfraternity of the Purest Blood is still present in our church, taking part in the Holy Week functions of the parish. The Blood’s chapel before 1936.